It’s the dead of winter and the combination of slush and unbearably cold weather can easily send you into a winter outfit rut. While your usual winter uniform – sweater and jeans – can do the trick on a lazy saturday, when it comes to going to the office you still need to look put together. The question remains; what to wear? 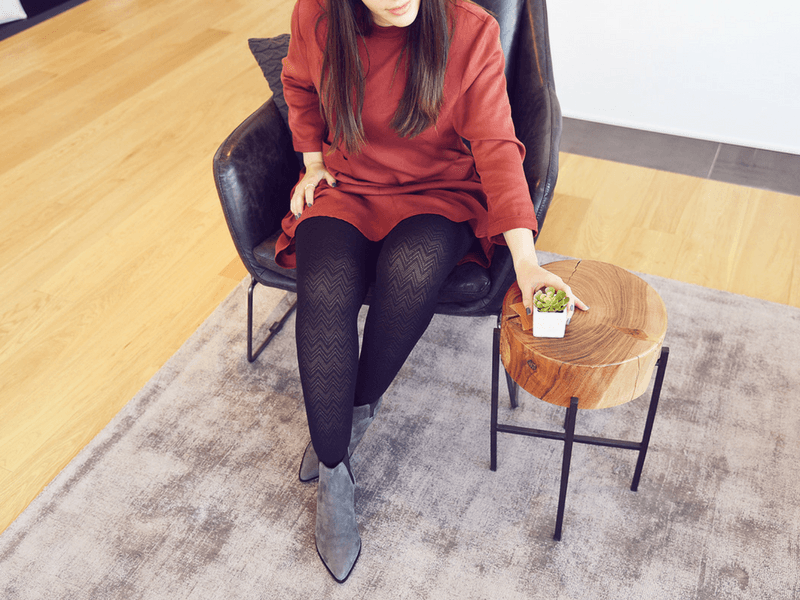 My go-to winter office outfit includes a pair of warm winter tights and a chic dress. Winter tights actually keep my legs warmer than a pair of jeans and they pair easily with all of my favourite dresses including those I bought in the Fall. Winter tights can switch up the look of all your dresses and allow for a winter-approved outfit that’s still chic and professional for work. To get you through the week, I have 3 dress styles that are perfect for your 9 to 5. It’s no wonder they’re all wardrobe staples! Peep these outfit ideas for winter dressing at the office! A black dress is a closet must-have that can be reinvented every season. To transition your LBD into the winter, choose a pair of warm tights with herringbone pattern in burgundy. It’s the perfect way to add some colour to your wardrobe and to have a look that’s both office and winter approved. A dress in a bold hue like burnt orange or burgundy should always live in your closet. Wear a colourful dress in the winter with a pair of warm black herringbone tights. Patterned tights will help add some texture to your look, all while keeping you warm. Finally, a dress with a graphic print is another wardrobe must. I love this dress style from Eve Gravel, striped black and white that’s also warm and cosy. Complete your look with warm burgundy tights and you’re ready for a day at work. Which dress style do you wear at work?